CompMusic has a workplan to be carried out, but it is just a plan. The project will be able to change its direction depending on the intermediate results obtained and on the new ideas that might come up. Here is just the originally proposed tasks, ready to be rethought. The culture-specific problems on which we will start working are not yet defined; in fact, this is the first taks of the project. We have defined the main transversal tasks and research approaches that we will use to tackle our ambitious aims. 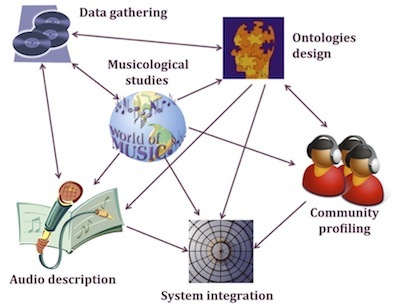 These general tasks are: (1) gather and organize audio recordings, metadata, descriptions, scores, plus all the needed contextual information of the selected music repertories; (2) identify and study the required musicological references in order to understand the chosen repertories within their cultural context; (3) design the ontologies needed to annotate and analyze the gathered music collections; (4) work on audio content analysis approaches to help describe the music collections chosen; (5) work on a social-computing approach to characterize users and communities, modeling their musical preferences and behaviors; and (6) develop systems that, by integrating the results of this project, can show the relevance of this research approach for the discovery of our world's music. Target: Gather information of the musical repertoires within the selected cultures: audio music files, metadata, descriptions, scores, plus all the needed cultural and sociological information to contextualize the music. Process & technologies used: Repertories are compiled combining acquired CDs, Internet resources, library resources, and personal collections. Musical experts describe and annotate the collections. The analysis results of Task 4 are added. The hardware/software infrastructure include a storage, computation, and validation systems. Expected results: Large open repository of musical data (using Creative Commons licenses when possible) using an RDF data model. Duration: The entire project but with a decreasing effort as the project evolves. Profiles involved: Musicologists and musicians from each musical culture plus music information management researchers from the MTG. Milestones: Month 18: Definition of data formats and infrastructure. Availability of a basic repertoire of Ottoman and Indian (Hindustani, Carmatic) music. Month 36: Repository infrastructure in place. Availability of basic repertoire of Chinese and Andalusi music. Month 54: Availability of extended repertoire of Ottoman and Indian (Hindustani, Carnatic) music. Month 60: Availability of extended repertoire of Chinese and Andalusi music. Target: Carry out musicological and cultural studies to understand the chosen repertories within their cultural context. Process & technologies used: Study the musical specificities of each repertoire, the similarities and differences between the selected music cultures, and what can distinguish them from the classical Western culture. We focus on the issues of similarity, music categorization, and context of usage of the music. Open notation systems, like Humdrum, will be used to integrate information and perform multidimensional analysis through user-defined musicological criteria. Expected results: Musicological and cognitive theories of the non-Western music studied with a multi-cultural perspective. Duration: The entire project. A constant feedback will be generated between this task and the rest of the project tasks. Profiles involved: Musicologists from each musical culture plus researchers specialized in computational musicology from the MTG. Milestones: Month 18: Musicological studies of Turkish and Indian music. Month: 36: Musicological studies of Andalusi and Chinese music. Month 60: Comparative musicological studies of Turkish, Indian, Andalusi and Chinese musics. Target: Elaborate the musical ontologies needed for annotating the gathered collections. Process & technologies used: Three different approaches will be carried out: expert knowledge extraction, music listeners tag elicitation, and knowledge extraction from the web. Expected results: Contributions to the Music Ontology Specification to support the musical cultures selected. Profiles involved: Musicologists, musicians and linguists from each selected culture plus music information management researchers from the MTG. Milestones: Month 18: A working ontology for Turkish and Indian music. Month 36: A working ontology for Chinese and Andalusi music. Month 60: A unified working ontology. Target: Develop signal analysis techniques and machine learning approaches to describe the music collections chosen, using the audio recording plus all the information gathered in Task 1. Process & technologies used: Evaluate the validity of existing MIR techniques. Study how different facets of music description contribute to automatic classification. Develop analysis techniques that take into account non-Western tuning systems, performance styles, and musical instruments. Expected results: Data models and metadata to include as descriptions of the music and to be added in the database created in Task 1. Profiles involved: Researchers specialized in audio signal processing and machine learning from the MTG, plus experts from the different musical cultures. Milestones: Month 18: Identification of limitations of current audio analysis techniques for analyzing Turkish and Indian music repertoires. Month 36: Results in techniques specific for analyzing Turkish and Indian music repertoires. Identification of limitations of current audio analysis techniques for analyzing Chinese and Andalusi repertoires. Month 54: Results in techniques specific for analyzing Chinese and Andalusi repertoires. Target: Characterization of users and communities, modelling their musical preferences and behaviours. Process & technologies used: Explore information sources that capture music listening behaviour, web search statistics, mining musical preferences from social webs, and inference from demographical, geographical, and psychographical data. Expected results: Preference and behaviour representations, which will include audio descriptors, and music ontologies knowledge, personality information, general cultural context, and short-term behavioural context, appropriate to a specific cultural context. Profiles involved: Researchers from the MTG specialized in human-computer interaction with the contributions by experts and non-expert users from the selected musical cultures. Milestones: Month 18: First user and community models based on data from the social network freesound.org. Month 36: Identify relevant social network sites of the musical cultures selected with which to carry computational studies. Month 54: User and community models based on culture specific social networks. Target: Work towards unified computational models that capture the different aspects of a music discovery task capable to explore the world's music. Process & technologies used: Integrate the data models developed in Task 4 and the user models developed in Task 5. Develop techniques to allow the system to evolve with the user, with the context, and with the availability of new information. Expected results: Computational models of relevance to the discovery of the world's music. Duration: The entire project but with an increasing effort as the project evolves. Profiles involved: Researchers from the MTG with the contributions by experts from the selected musical cultures. Milestones: Month 54: Computational active models for culture-based music discovery. Month 60: Prototype of a system for culture-based music discovery.